I’ve been in touch with my web masters and they tell me that IE7 is not a fan of the “align right” code in my picture postings. They also tell me that there are not too many fans of IE7 out there anyway and that I could just let it be. But I’ve now received multiple emails from readers who are having trouble seeing the text on other browsers as well. And so, I’ve go back through all my posts and removed the “align right” code which should alleviate the problem. It does push the pictures over to the right (covering up some of the months archive) but it’s a small price to pay to be able to read what I’ve written. And so, I hope that this permanently fixes the problem. If you are still having difficulty, please write to me. I really appreciate the heads up. Also, if you want, you can now go back and read all the wonderful excitement you may have missed before because of those dreaded pictures. Thanks, again, to everyone who wrote to me to tell me about the problem. 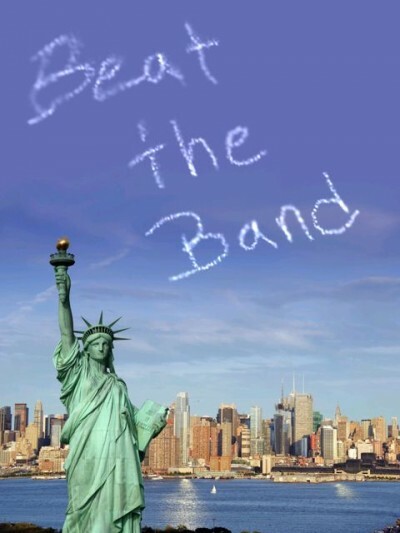 So, since BEAT THE BAND is coming out on September 14th—which is just 52 short days away—I thought I’d start some heavy duty promotion. You can see my first shameless plug in the picture below. It was fairly pricey to hire the plane out and all but I think the few minutes the good people of NYC got to see my message will translate directly into mega book sales. Of course, it might have been smart to tip people off as to what “Beat the Band” was supposed to mean, but what can you do. After my wonderful visit to the Burial Park last week I decided it would be a good idea to lose a bit of weight. Just, because, you know, all the pastry eating that goes along with being a writer (an occupational hazard, I’m afraid) has taken it’s toll on my waistline. Plus, I need to fit in the suit I purchased eight years ago so that I can wear it to my step-son’s wedding in September. You might not know this about me (or maybe you do, but I’ll assume the former) but I REALLY love my food. A really good tasting menu dinner with great wine is probably in my top five best things to do of all time. In fact, if I ever find out the exact date I’m going to vacate this lovely planet of ours, I would seriously consider flying to London and going to Gordon Ramsey’s wildly-overpriced-but-amazingly-worth-it restaurant for my final meal. The other four best things of all time? Well, I’ll probably get around to telling you at some point or other. Of course, now watching my food so that I can shed my winter coat has taken precedence over eating truly fabulous food. But that’s not to say I’m not cooking some good meals. In fact, I made probably the best eggplant parmesan that has ever been tasted by human (and dog, because Scooter demanded his share) lips. I could be all modest and say that it was just simply tasty. But I’m not going to do that because it wouldn’t be true. I made my own tomato sauce and carefully sliced the eggplant into thick slices (a secret I learned from my friend at Zambri’s Restaurant - the best Italian in Victoria by a Canadian mile) and breaded and fried the pieces. I layered it all carefully with parmesan and mozzarella cheese and baked the hell out of it until the top was crispy-licious! I wish I had a way of sharing it with all of you because you would have been impressed. What else? Let’s see. I’m still in love with my iPad. So many great apps to play… I mean… work with. If you haven’t bought one yet, you should. Going through serious hockey withdrawal. It always hits mid-July. But luckily I’m waist-deep into Book Three of my Swim the Fly Trilogy. I’m not sure I should call it The Swim the Fly Trilogy but I don’t have a better name for it right now, so we’re stuck with that. I guess that’s about it for now. Oh, yeah, I’m reading THE PASSAGE by Justin Cronin. It’s a big long fat book but really well done. It’s vampires after the apocalypse but that doesn’t do justice to it at all. I’ll recommend it right now even though I’m only half through, just because the writing is so good. It’s scary vampires. The way they were always meant to be. I have no idea what the grandeur part of that title means but I do have some wonderfully exciting news to report about graves. And no, it has nothing to do with the new Twilight movie. Yesterday my wife and I went on a lovely field trip to a burial park. Yes, they do call it a burial park. Just like an amusement park but less amusing. Think of a water park and remove the fun slides and wave pools and replace those with tombstones and mausoleums. That’s right. You’ve got the picture now. Even though we are nowhere near the age one thinks about dying (well, actually, I think about dying quite a lot. How I might go. If it’ll be in a plane crash or an earthquake or if my heart will explode or if I will simply go mad and start drooling and forget my name and all my internet passwords) BUT my wife thought it prudent for us to make all the arrangements for our inevitable passing (because we’re all going to go sooner or later) so that our families wouldn’t have to worry about it when we do “move on” and so that there wouldn’t be any arguments or fisticuffs over where we should be planted and what type of headstone (color, design, engravings, etc) we should have. Thus, our jaunt to the burial park to choose and pay for our gravesites. This is only part one of the process. We still need to choose a funeral home and a casket (can mine be in the shape of a hockey net?) and a headstone. Well, wouldn’t you know it. All the cozy shady tree lined nooks of the graveyard were already “occupied.” And so, we had to settle for the new “wing.” In a spot behind a recently built meditation circle, next to a young sapling of a tree that will be grand (ah ha! there’s the grandeur I promised you!) in a hundred years or so. 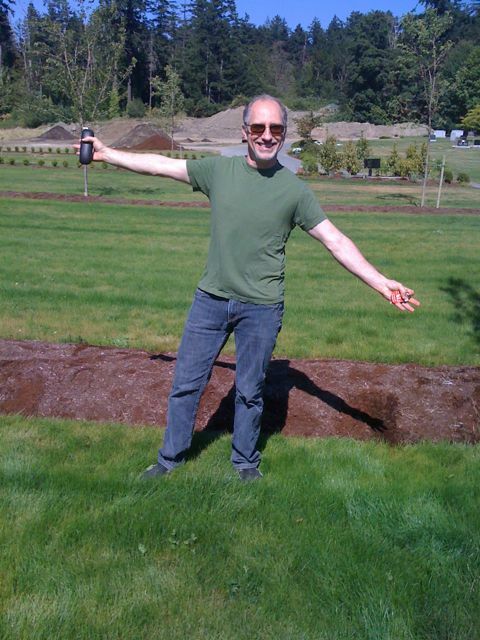 Here’s me standing on the spot where one day I will be buried. Pretty neat, huh?! I suggested to my wife that we might want to consider getting our headstone put up immediately (well, after the two months it takes to carve the thing). Just so that we know it’s there waiting for us and so that nobody else can steal our perfectly chosen spots. This way, we can go visit our plots, even have a picnic lunch (it is a park after all) and enjoy our gravesites while we still can!! !